It's a changed game, but it's never been such spectacular fun to play, or so creative to tinker with. I have to start this with a warning, then a little tantrum, a few insults and a dash of paranoia. Apologies to those of you who already know what I'm going to say and are either fine with it or all raged out - you guys can skip this section. Diablo 3 can only be played online. You can play it on your own or co-operatively, but neither mode works when Blizzard's servers are down, and neither mode is fun when Blizzard's servers are slow. In my six days of playing it, I got disconnected twice and experienced unplayable lag five times, each time when my own internet connection was working fine. At times, the servers were down for hours. That's pathetic. There are valid reasons for forcing multiplayer characters to play online, but none for excluding an entirely offline single player mode. If you don't have a connection you can reliably play multiplayer games on, don't buy Diablo 3. Skip the rest of this review. Blizzard have chosen to exclude you completely, and I'm genuinely pissed off by the hostility and callousness of that decision. For the rest of us, it's worth knowing that the $60/£45 price for Diablo 3 doesn't mean you'll always be able to play it. The game itself would have to be phenomenally good for all this to be worth putting up with. The Diablo games are simplified top-down RPGs: you click on a monster, and your guy hits him with a satisfying thwunk. If you'd asked me what made the repetition compulsive beyond that, I'd have said two things: the agonisingly tough choices in which skills to pick each time you level up, and the excitement of finding a fantastic rare item. In Diablo 3, both those things are gone. You never make any permanent choices about your character. Each time you level up, you get access to a new skill, and you fit these into an increasing number of slots. Eventually you can have six equipped at a time, and between fights you can put any of 20-odd skills in those slots. Every level 30 Wizard has access to the same skills as every other level 30 Wizard, the differences are just a question of what they currently have equipped. It takes a while for your range of possible skill combinations to get interesting, particularly if you don't realise there's a hidden option to remove some of the baffling restrictions on what you can combine. But when it does, about two hours in, it gets really interesting. Every level up brings a new skill or two, and every new skill can be the foundation of dozens of different character builds. Experimenting with new abilities, and strategising about how to combine them with the others, is the game. A seemingly feeble skill sometimes spurs you to try it with others you've shelved, and discover an entirely different playstyle that works in its own way. And a powerful one sometimes mixes with something you've been using for hours to create a spectacular new tactic. As the Wizard, I liked to stick with a set of area-effect spells that freeze and shatter huge mobs. But once I got Disintegrate, a magic death ray that cuts through whole ranks of enemies at once, I was able to ditch some of the others to focus on survivability: teleportation, invulnerability and reactive ice-armour to chill attackers. It's incredibly satisfying when a new tweak like that turns out to be effective, and your playstyle ends up feeling like an invention. Part of the reason for that, and a lot of the meat and complexity of this system, is in the runes. Like skills, they unlock at predetermined levels. But they offer an optional modification to a skill you already have. I can tweak Disintegrate to fire from both hands at once, hitting a wider path of targets, or channel it into one beam while smaller rays zap anything that gets close to me while I fire. Both are magnificently powerful in different situations, and I loved figuring out which one gelled well with other skills. By a certain point, the difference between your Wizard and mine isn't your Wizard, it's you. The skill/rune combinations you've picked from the billions of possibilities are an expression of something very personal about the way you like to play, and that makes it easy to get attached. It's a fascinating test lab for skill combos, but what makes it more than an intellectual exercise is the sense of power. 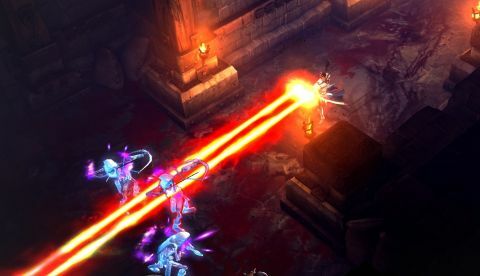 I said the Diablo games are about hitting a monster with a satisfying thwunk - the rest of the series, the rest of the genre, has now been utterly out-thwunked. Each Diablo 3 class has an astonishing tactile pleasure to it. The Barbarian is convincingly physical: all his attacks involve massive effort and ground-shaking impact. When they connect, monsters aren't just toppled: they're cannoned, decapitated, torn apart. The Wizard feels like an electric detonation: every crackling blast of energy has the sense of something pent up being released, into enemies that spasm, blacken and split. The Demon Hunter is a backflipping tactician, forcibly rearranging the battlefield to leave everything trapped in a dazed clump, to be butchered with a spluttering stream of fire. The Monk is a human projectile, appearing at each enemy with a fist already in their flesh, then snapping through the rest of the mob in a rhythmic strobe of precision blows and showers of blood. And the Witch Doctor spits flaming bats. It's as much the noise as the look: the sound for each attack is perfectly judged to suggest something excitingly potent. They even change depending on the Rune modifying them: an explosive one for the Wizard's Shock Pulse adds a quiet charging noise before each release, suggesting an unseen payload of power. And the feel is more than aesthetic. Most of Diablo 3's skills are very specialised, useless in some situations but devastating in others. Apply four or five of them to the right kind of enemy in the right order, and the effect is more spectacularly destructive than anything I've seen in a game like this. Armies are ripped apart, whole ranks explode, blood fills the air, the earth shakes. When a sight like that is the result of a build you've personally designed, it's a satisfaction like nothing else. Weirdly, only a handful of these skills actually use the weapon in your hand. In designing these intricately configurable storms of damage, Blizzard didn't have room to incorporate what you're holding. Three of the classes never even swing their weapon - it exists only as an abstract damage number to multiply their effectiveness. To a wizard, a bow is the same thing as a staff. For other items, too, it's hard to care about the banal stats they offer. You do find incrementally better kit, and there's an inherent addictiveness to that, but the excitement of finding something truly remarkable is almost gone. There's not nearly enough variety in either the type or effectiveness of what you find, and the significance of stats is fussily abstract: +93 strength has no effect on a Monk's punching damage, because that's not her 'primary attribute'. The only place I found dramatically better items was on the new auction house, which also seems custom-built to destroy the thrill of finding anything good in-game. With such a vast playerbase, of course hundreds of people have found the absolute best item for someone of your class and level, and of course that flood of supply has made it all affordable. At every level, pocket change could buy me a weapon twice as powerful as the best I'd found. And the one time I did it, it rendered loot irrelevant for hours. Blizzard plan to let you buy and sell items for real money soon, but that feature's not in yet. I'm no longer worried that it'll undermine the excitement of finding your own loot - there's not much left to undermine. It just isn't the core appeal of Diablo any more. But luckily, there's plenty to replace it. Beyond levelling up, there is a sense of discovery and reward as you play through Diablo 3. It comes from the world. Each of its four acts is a new land to explore, and each land is made up of sprawling, beautiful places. The soft-focus textures and scribbly detailing often make it feel like you're walking through concept art, in the best possible way. Each region throbs with a new colour: autumnal fields, dazzling sands, burning pits, and more exotic themes I can't spoil. Any time there's a drop, the view below is staggering. Sometime's it's just a gorgeous landscape, but later there are sprawling cities and backdrops of action and violence that show more going on in the world than your own quest. It's a constant pleasure for the digital tourist, and these jaw-dropping settings give your journey a sense of drama and adventure the series hasn't always had. Adding to that feeling, there's a range of interesting scenes you can stumble upon between objectives. A conspicuous corpse, a cryptic note, a lone tombstone, or a land-locked shipwreck can lead to an Event: a small isolated story that usually ends in a horrific onslaught of creatures. Diablo 3 never runs out of hideous things to throw at you, and the variety is amazing. Each act, and sometimes each zone, is dominated by several species of creature you've never seen before, all horrible and entertaining to fight in a different way. It's not hard to make a monster look 'hellish', but it's impressive how many new and increasingly freaky ways Diablo 3 pulls it off. However spiky, vicious and tough the horrors get, they're always satisfying to kill. And some have neat little tricks. Giant vultures circle, refusing to swoop within attacking range until you're busy fighting something else. Giant wasps spit streams of their young at you, slow but unstoppable, forcing you to dodge. Boss creatures can summon walls of rock wherever they like, blocking your attacks and sometimes intentionally penning the two of you in, mano-a-bosso. They're varied further by mobs of Champions and Minibosses, Diablo staples that provide walking difficulty spikes. But what makes them really extraordinary, and the perfect foil to your ridiculously powerful character, is the scale. Some are so big it takes a moment to register that they're even attackable, and others swarm in numbers that fill the screen. Smashing through these skittering hordes in a spray of rent meat and chitin is exhilarating, spectacular, gruesomely heroic. Even the boss fights aren't awful - a genre first, as far as I can recall. Rather than simply being absurdly tough, each is properly dangerous. The challenge isn't to tank their damage while you chew through a towering health bar, it's to move quickly enough to dodge certain death. Those particular fights are better with friends, and co-op is beautifully seamless: it's one click to join someone who's currently playing, and one more to teleport to their side, mid-fight. You can also revive each other when down, which leads to some dramatic rescues - despite the negligible penalty for respawning instead. But in longer sessions, co-op sometimes feels like an awkward fit. There's a very intentional focus on story this time, but almost no systems to make that work with more than one player. If one person skips in-game dialogue, it's skipped for everyone with no warning, and often no way to get it back. Even with cut-scenes, there's no way to vote on whether to skip them, and no voice-comms to discuss it. All of which makes the online-only thing more baffling. It's a phenomenally good game, immediately fun to play and enduringly compulsive, albeit for very different reasons than the rest of the series. But it comes shackled to this pointless, damaging restriction. Should I give it a punitive 0% for that? That's not terribly helpful if you want to know how good the game itself is. Should I ignore it completely and give the game the score it would otherwise deserve? I can't quite do that. I'm just less excited about owning Diablo 3 when it lags out and kicks me off from time to time. There's an easy way to resolve these dilemmas. If you're a friend, and you ask me whether you should get it, I'd ask if you have a fast and reliable connection. I'd make you aware of the problems beyond that, slander Blizzard a bit, then say this: God yes.